Here's my Cyberdyne air/fuel ratio mixture gauge. Here all of the LED segments are lit, but under normal circumstances the mixture is "perfect" (stoichiometric) when the bottom LEDs are lit through the first green one, and the rest of the upper ones are turned off. Here it is under more normal circumstances (engine running, at altitude). It's showing a tad on the rich side, since the yellow segment above the two green ones is lit. It would take the very top red LED to make the engine run rough due to richness, and the very bottom red LED only flashing occasionally to make it run rough due to a too-lean condition. This is during the summer when it's hot. In colder weather, the "comfort zone" is narrowed to about 4 segments, rather than 6. There are at least 20 different gauges that are similar, and many can be bought from Jegs or Summit Racing. The Cyberdyne that I have is $37 at Jegs (part number 280-7009 at the top of the table). 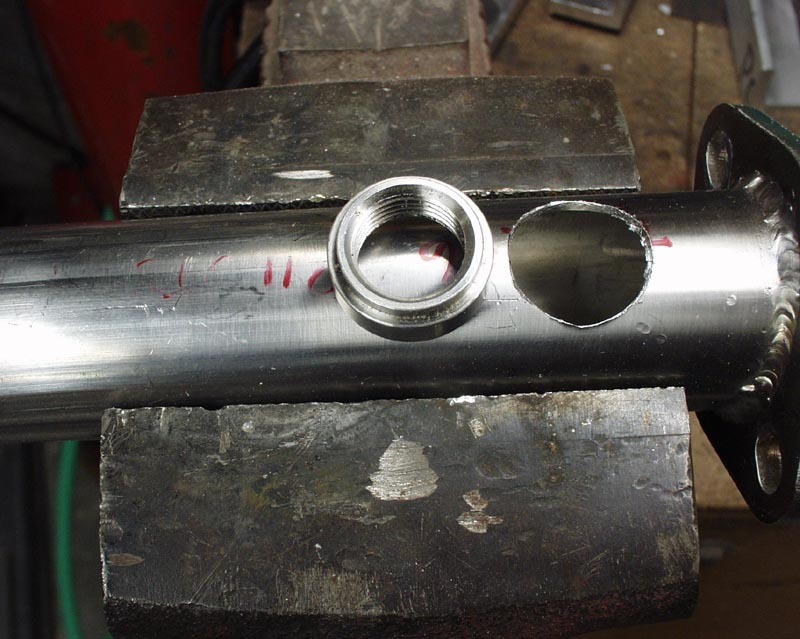 It fits in a standard 2.063" hole, and burns very little electricity. 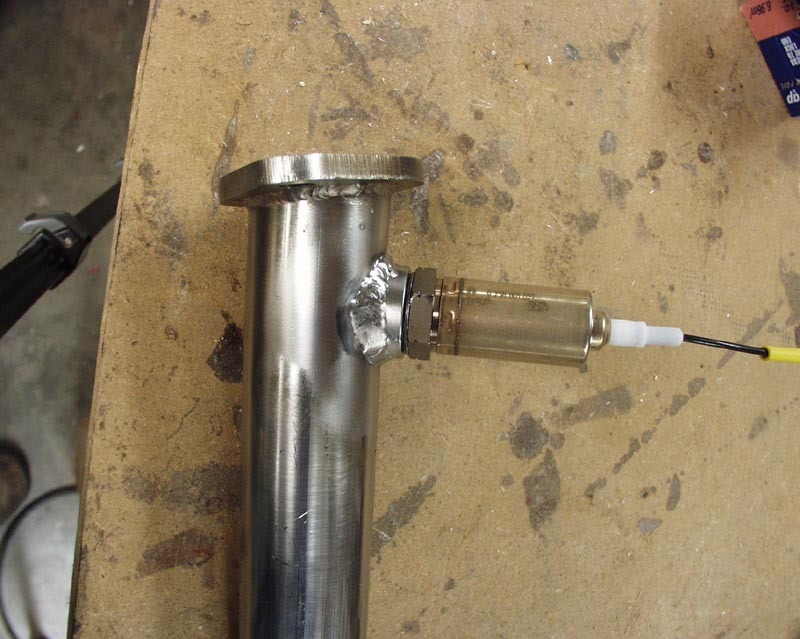 You'll need a "bung" to screw your O2 sensor into. I bought mine from Burns Stainless, and welded it into my exhaust downpipe, about 8" from the closest exhaust stack. Jegs also sells these for about $8. They are the same thread as a spark plug, if you ever need to make a plug for it. Here's the Bosch O2 sensor ($30 from your local VW aftermarket emporium) screwed into the bung. You don't need an expensive "three wire" sensor..the cheaper one wire "Premium Oxygen Sensor" is fine (Bosch part number 11027) . If you ever screw it out, make sure you put anti-sieze compound on the threads before you put it back in (it comes with some on it for initial installation). 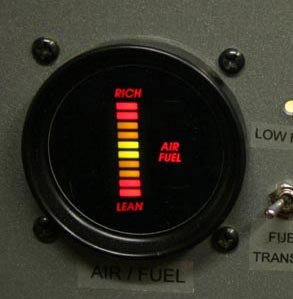 I've been told that the O2 sensor will only last about 100 hours on 100LL fuel, because the lead will foul it. I have 290 hours on mine now, but I burn 93 octane auto fuel most of the time. 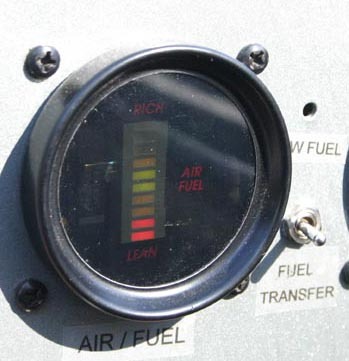 Even if you run 100LL, the cost for a new one every 100 hours is insignificant compared to the fuel cost (a nickel a gallon extra, based on 5 gph). Having said this, over the 750 hours that I've been flying behind this system, I've had one O2 sensor croak after just a few hours, but I chalk that up to "infant mortality". They're usually good for a lot more, but when you find that the mixture reads leaner than you know it really is (by checking EGTs), it's time for another one. Return to Mark Langford's Corvair engine web site.